Premium, long lasting tool cuts, strips and crimps CAT3, CAT5e and CAT6/6A cable using RJ11/RJ12 standard and RJ45 Pass-Thru™ connectors. 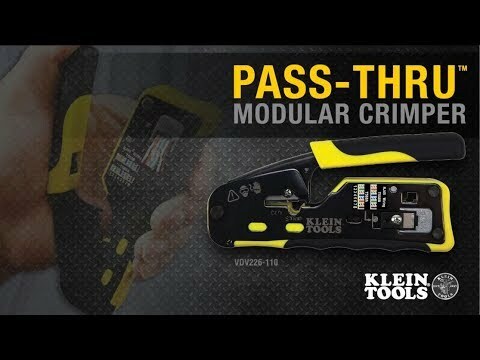 Pass-Thru™ technology significantly reduces prep work time; wiring diagram on the tool helps eliminate rework and wasted materials. Compact, non-slip comfort grip reduces hand strain and stores easily. For use with Klein Pass-Thru™ Connectors (in packs of 10, 50 or 200). Do NOT use the tool to pull the outer jacket off of the cable. Doing so may damage the conductors and the tool.